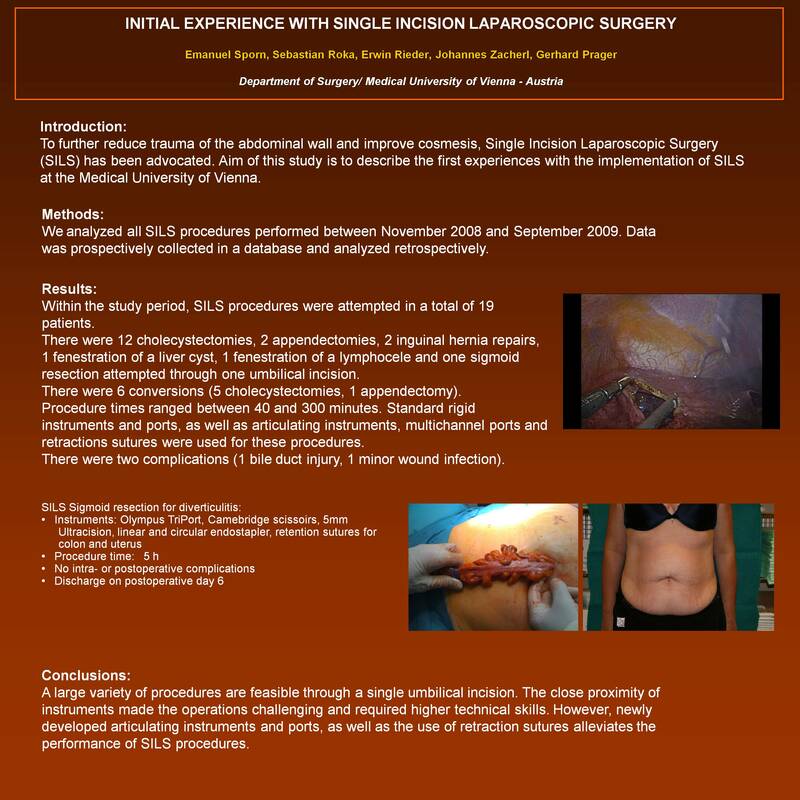 Introduction: To further reduce trauma of the abdominal wall and improve cosmesis, Single Incision Laparoscopic Surgery (SILS) has been advocated. Aim of this study is to describe the first experiences with the implementation of SILS at the Medical University of Vienna. Methods: We analyzed all SILS procedures performed between November 2008 and September 2009. Data was prospectively collected in a database and analyzed retrospectively. Results: Within the study period, SILS procedures were attempted in a total of 19 patients. There were 12 cholecystectomies, 2 appendectomies, 2 inguinal hernia repairs, 1 fenestration of a liver cyst, 1 fenestration of a lymphocele and one sigmoid resection attempted through one umbilical incision. In 5 procedures (cholecystectomies) additional ports had to be placed. One appendectomy was converted to open surgery. Procedure times ranged between 40 and 300 minutes. Standard rigid instruments and ports, as well as articulating instruments, multichannel ports and retractions sutures were used for these procedures. There were two complications (1 bile duct injury, 1 minor wound infection). Conclusions: A large variety of procedures are feasible through a single umbilical incision. The close proximity of instruments made the operations challenging and required higher technical skills. However, newly developed articulating instruments and ports, as well as the use of retraction sutures alleviates the performance of SILS procedures.